Quote: "Experience is the benchmark of Maturity"
First US G1 Marvel Comic Appearance:Brothers in Armor! As a reviewer, it's rare I take moment before going into a character to explain things. From a generalist approach, Hasbro has tried to quash the used of the Prime title since Transformers Animated. We have the 13 respected Primes; we have Optimus, no more no less. However they still need Hot Rod/Rodimus Prime to sell toys for . . . err I mean for the ongoing stories. This explains why he's called Rodimus. Speaking of which the Combiner Wars series is based on the series of the same name which is ongoing via IDW comics. I've read the actual IDW Combiner Wars #41 hate to play spoiler, but Rodimus/Hot Rod was nowhere near the Enigma Of Combination when it went off in the story. There was Prowl, Ironhide, Mirage, Sunstreaker, and Optimus Prime himself. Hotrod/Rodimus was off on the Lost Light with Megatron trying to find the Knights of Cybertron when this thing went BOOM and made a new combiner. You know you'd think given how dangerous that thing is they'd locked it up tighter. What can I say about Rodimus Prime? In the G1 cartoon he's portrayed as the leader with clay feet, the one always doubting himself. He didn't need someone calling him out for inept leadership since he was doing it all the time to himself. I am surprised he never asked on screen why did he have to catch the Matrix of Leadership? The real strange thing here is the Matrix of Leadership is portrayed as the ultimate source of wisdom (as seen in the G1 episodes "The Return of Optimus Prime Part 2), something that you'd think would kick in sometimes with a little confidence. Now Hot Rod on the other hand is a bot of different color. He's cool, he's confident; he could kick Blurr's tailpipe in a race, have a cold one, and look as cool as ice. Heck come to think of it, he did beat Blurr in a race one. He never stresses out; he's always willing to go for the gold. He's willing to take risks if it meant saving lives. He's the one who Kup wanted to straighten out. In more than a few ways he's the leader the Autobots could've used, not the one Rodimus Prime was. From what I've gathered Rodimus/Hot Rod in the IDW continuality takes a mixed approach to both these characters. He was originally a rebel without a cause. He's shown more intelligence than his G1 counterpart because when Megatron used him as a robot shield against Optimus Prime, he didn't stand there, he transformed so Optimus could get a clear shot. He's become a leader because he's put in his time, racked up those hard experiences that torment all men and machine with what ifs. 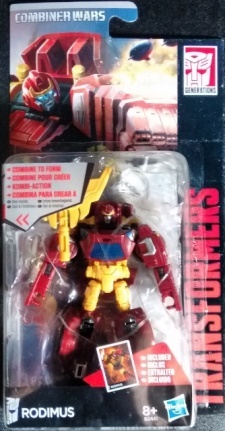 Rodimus's on the box bio reads as follows, "Brash warrior has the makings of a skilled commander and honourable leader." Why do I feel like when I read that, that it could've been a haiku? 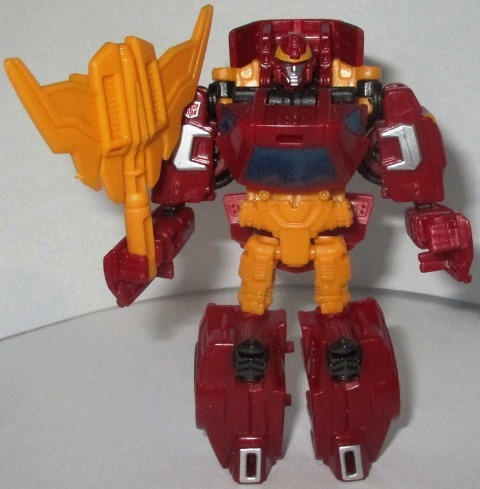 Rodimus comes out of the box in robot mode, so no transformation yet. Both his legs up to his hips are ball joints, which is great. With a little bit of work you can pose him almost any way you want to with his legs. The arms are a bit of a mish-mash. You have screws connecting both sides of the arms with ball joints up in the shoulders. The arms have a few flaws, the wheels prevent certain poses, and force you to move them certain ways. Then you have the fact that the ball joints are on a small 90 degree pivot. 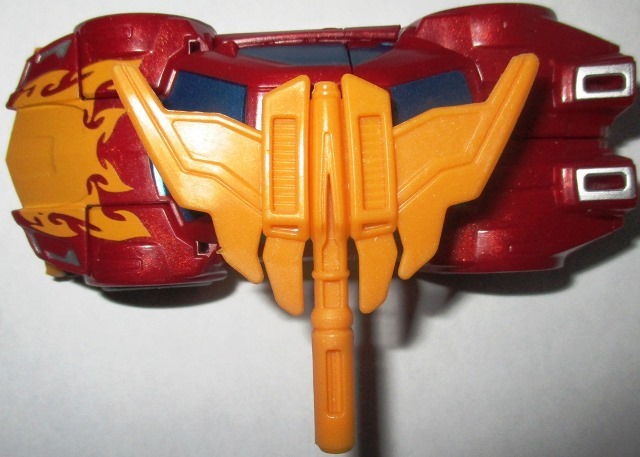 This pivot prevents the arms from stretching out a few millimeters so that it looks like Rodimus is playing guitar with his shield/spoiler. We've done the arms and legs, what's next? Why his core body, every warrior needs a good strong body, even Megatron said so. His chest doesn't lock into place, so to make it look like it come from the factory just push it down as much as you can. His head is actually plugged into place here, and I give Hasbro full marks for detail work on his face. The back is nothing special, some hollow bot syndrome here, but it makes sense since 99% of the time you won't see this. Let's transform Rodimus from robot to car. I'll be damned if I ever figure out what model he transformers into. Just to be candid here, I transformed him the first time I got him without looking at the manual, and no I don't own the repaint he's based on. Get the arms nice and straight, and away from his body. Now pull both his back and front together, ideally meeting where his head is. Now bring the combined mass that is his body towards his feet that should be together by the way. To close him up, slip his arms into place, and then plug the spoiler into his feet. Let's look him over shall we? He's suppose to resemble a hot rod, get it, Rodimus, hot rod car? Whoo boy tough crowd. For the most part he delivers on this premise. He has he flaming paint job on his hood, silver spots for the headlights. The axe/shield looks like a spoiler that we'd expect from this kind of car. 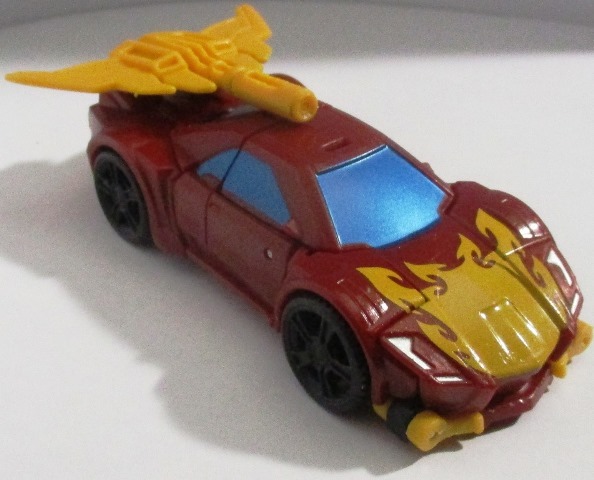 While I originally thought the handle didn't look good going over the roof of the car, I realized in retrospect that a child might see this as Rodimus's super weapon to hit the Decepticons with when in vehicle mode. Now there are some minor flaws with him in this mode as great as it is. The wheels are clip-on's, something I really hate, especially given what some places charge for Transformers these days. When you look at him straight on you can see those hinges I mentioned earlier that handle his shoulders. It's like design wise they never really found a good way to use it, so they try to keep it out of view. As with the G1 combiners there are multiple roles for the respective bots in a set. Rodimus isn't one of those bots which is why I included this blurb. Remove the spoiler from his from the back, then plug it into his roof, then we're done. Then it's just a matter of plugging him into Optimus Maximus's chest. Transformation Design 1/10 I know that score has got to hurt. It's well earned for 2 reasons. The first I could transform him without looking at the manual, and the second being he's a repaint. Durability 8/10 Feels like we're on a roller coaster ride. General usual, and even extreme events I don't see breaking him. However, by the same token those hinges that hold his arms to the main body scream break to me if put under too much pressure. Fun 7/10 He's a good little bot. The only thing that kills his fun factor is movement problems. Aesthetics 10/10 He looks great in both auto mode, or in robot mode. He doesn't have too much hollow space you can easily spot in either mode. Articulation 7.5/10 He's got a full range of motion. The one complaint I have here is a design flaw. The front wheels attached to his arms and forces the arms to move a bit to the side when they are near his chest. This does prevent him from assuming certain poses. Value 0/0 I want to be clear here I got this guy as a gift. He retails for about $13-$14 Canadian. I feel given when he comes with, he's overpriced. Anyone who checked out the Generations line of toys would see that they cost less and came with more stuff. Overall Hey Blaster give me a drum roll! 6.7/10. Not a great score, not a tank, but not great either. He's a fun little bot, and if you have the Titan Metroplex then you will want him like you want almost all Legend figures. The problems I have with him aren't deal breakers.